GET YOUR HANDS ON THE KONICA MINOLTA BIZHUB C224 RIGHT HERE, RIGHT NOW! If you’re looking for the perfect place to buy a brand new Konica Minolta C224 copier, then look no further! We at Arizona Copiers pride ourselves on stocking a vast array of machines and their related supplies and peripherals, and this one is no exception. Whatever your needs, we can help you find the best solution. Our company philosophy is simple: We are not happy until our customers are. That’s why we guarantee everything we sell, from purchase to delivery. We welcome any questions or feedback you may have – contact us today! A business thrives on two things: People – the brains behind and smiling public image of your operation – and infrastructure – technology, logistics, and all the other myriad components that keep your business running smoothly each day. Happily, with its vibrant color production, a high-speed, high-capacity output, adaptable scanning capabilities, and a suite of other technologically superior features which are at once productivity boosting and environmentally friendly, the Konica Minolta C224 copier (available now at the Arizona Copiers) is ready and able to contribute to your organization’s infrastructural solidity. In fact, it’s just what you need to take your office or small business to the next level. Our customers that have purchased the Konica Minolta C224 Copier recommend it, and so do we, which is why we’ve adopted a customer-feedback policy that ensures timely and safe delivery along with top of the line standard in service of whatever they may buy – including items like the Konica Minolta Bizhub C224 copier. 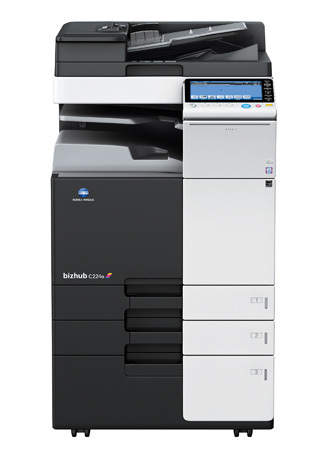 The Konica Minolta Bizhub C224 copiers at our facility are available now. Getting the copier to your location is also available for those who find that their unique situation requires it. In any case, the nature of our business and the repeat customers allow us to offer deep discounts to our customers while still providing top products like the Konica Minolta Bizhub C224. We invite and encourage you to contact us at your convenience with any Konica Minolta related questions you might have. So, what’s the bottom line? Simply this: If you or your business are looking for top of the line products like the Konica Minolta C224 or any of the other products Konica Minolta Carries contact Arizona Copiers the company which takes its commitment to customer satisfaction seriously, contact us today awe can’t wait to hear from you!